Probably won't watch it but still good for DC to get some exposure and cash. Always liked DC's animated films, live-action they still need to polish. Lego Batman 2 was amazing, so I'm cool with this. People should still play Lego Batman, though. Well the game was awesome and the cutscenes where one of the best bits. Will there be an official movie video game? I have to put this firmly in the "meh" column. I think they are overdoing the entire Lego thing, turning it into a grindhouse for quick cash grab schemes that they abandon as soon as things seem a bit spotty. While it isn't directly related I still remember their "Lego Universe MMO" which seemed to launch and get shut down in record time (I believe it's advertised in the versions of the Lego Harry Potter games you can DL from Steam) which really irritated some people. Seeing them deciding to broaden into movies makes me wonder if they really thought this idea through. That said I think from a DC angle before they seriously consider doing anything they need to get their house in order. As I said in response to the recent "We're going to kill Robin Off!!! (again)" annoucements, and Movie Bob pointed out in one of his recent videos, they have basically rebooted and re-interpeted their own continuity so many times and kept pulling shock events (major character dying, major character being rebooted as being gay, etc...) to the point where it almost becomes expected and there is rapidly becoming no real baseline to compare anything to. When the DC Animated Universe is the most stable thing and consistant portrayal of characters that they have you know there is a problem. I suppose it really doesn't hurt anything to be doing this, but really DC needs to reset it's traditional status quo and the versions of characters people know and want to see, as they are supposed to be, and produce in that direction for a while. 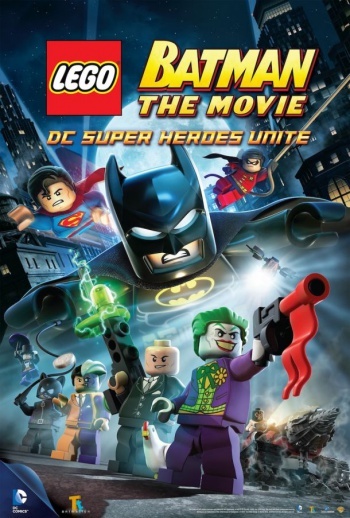 Getting behind gaming companies turning their lego-version into yet another full fledged alter-universe with movies seems to me to be the last thing DC needs right now. That said, it might make money, but if this is how it sounds it might be and they are just adding another 20 minutes or so of footage to re-packaged video game cut scenes.... I can't help but wonder who would buy that, and out of the people that will buy it, how many of them will be POed if it turns out to mostly just be stuff they already saw in a game they played. Looked at from this perspective the odds of this being a train wreck seem pretty high. I thought there already was a Lego Batman animated special? Or was that for Star Wars? Either way I don't really care. What would be cool though, is LEGO Batman Begins. Doo de doo- Wait a minute, this isn't a movie! That's wholesale deception! NOW THAT'S THE IDEA! It's just some repackaged cutscenes and a Clark Kent minifigure! SOLD! You're crazy like a fox here's my wallet! Ok seriously, after watching the trailer I did see some things I don't remember from the game. Will definitely pick this up. LEGO Batman: The Movie: The Game coming 2014. Believe. And Jim said Mortal Kombat was the best videogame movie ever. I really wish that they kept the protagonist silent like they did in the Lego Star Wars games. It just made the whole thing a lot funnier when the characters had to rely on gestures to get their point across. So is this how Warner Bros is finally going to get a Justice League movie to work? Too lazy to play a video game? Then buy the movie! That was Star Wars. They've had a couple 5 minute clips and a few half hour mini-movies. Pretty good actually if you don't try to take them seriously.